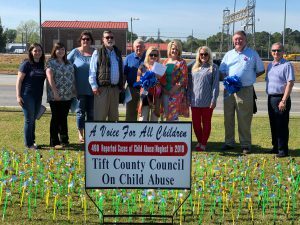 The Exchange Club of Tifton supported their local Pinwheel Ceremony recently, which raises awareness of Child Abuse Prevention. There were 498 cases of child abuse/neglect reported in Tift County last year, which is down from the previous year. The Exchange Club of Tifton, in partnership with various other organizations in the community, are working hard to lower that number and stop child abuse!